An innovative and proven curriculum was quickly outgrowing Shore’s existing facilities and resources. As ground broke for the state-of-the-art Center for Creativity, Shore trusted Creosote to develop a compelling narrative for its capital campaign, highlighting its goals and the impact on Shore’s future. At Our Finest raised $16.5 million toward a $20 million goal just three years into the five-year campaign. To harness the energy behind Shore’s vision, our team delivered a concept that included an interactive solution to assist in visits with key donors, an elegant and comprehensive case statement, a microsite to keep the entire community informed and various supporting pieces. 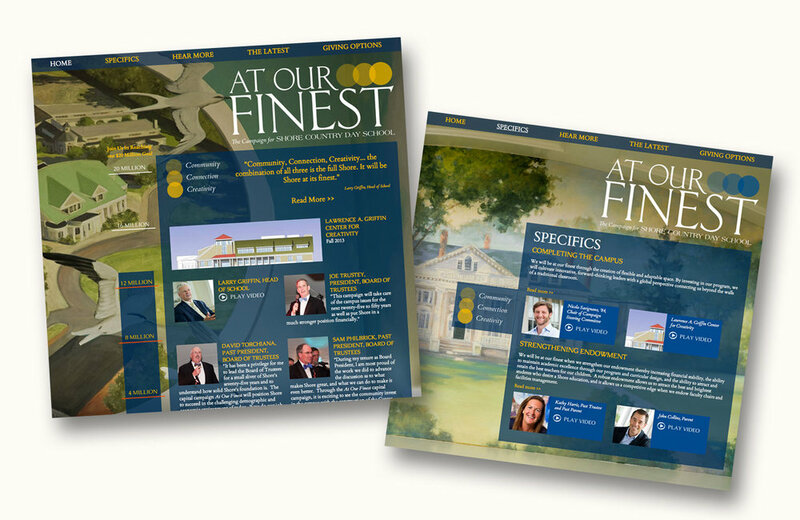 The print materials have immediate impact through imagery, creative design and editorial that speaks sincerely about campaign goals and makes the case for supporting faculty, financial aid, programs and campus improvements. Creosote partnered with this preeminent day school for nearly a decade in all of its marketing and branding efforts.